Can you even believe that we are only a few short days away from the end of True Detective? Well, season one of True Detective, but it’s still a much bigger ending since season two will be something completely different. On the eve of the big conclusion to the story of Marty Hart (Woody Harrelson), Rust Cohle (Matthew McConaughey) and their 17 year search for the Yellow King, series creator and wrter Nic Pizzolatto gave an in-depth interview to Buzzfeed discussing everything from crazy fan theories to the charges of misogyny and what season 2 of the HBO series might hold. Yes, even though we are losing Harrelson, McConaughey and director Cary Fukunaga, Pizzolato will still be around, writing and showrunning and hopefully, making sure season two is just as great as season one was. I just thought that such a revelation would be terrible, obvious writing. For me, the worst writing generally just “flips” things: this person’s really a traitor; it was all a dream; etc. Nothing is so ruinous as a forced “twist,” I think. We don’t have any plans to work with one director again. It would be impossible to do this yearly as we need to be able to do post while we’re still filming, like any other show. There’s some great guys I’ve consulted, and we’re all confident we can achieve the same consistency. 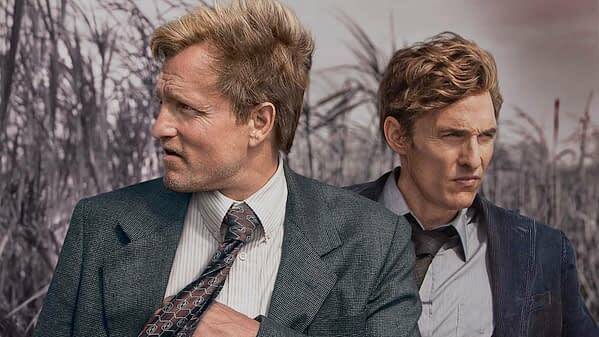 If it gets us more True Detective more often, I’m all for it. House of Cards, for one example, handles multiple directors with relatively seamless consistency, after all. Going forward, I want the show’s aesthetic to remain determinedly naturalistic, with room for silences and vastness, and an emphasis on landscape and culture. And I hope a story that presents new characters in a new place with authenticity and resonance and an authorial voice consistent with this season. Dominant colors will change. South Louisiana was green and burnished gold. The season finale of True Detective airs this Sunday night at 9pm on HBO. Head over to Buzzfeed to read the rest of the article, which is really great and insightful.